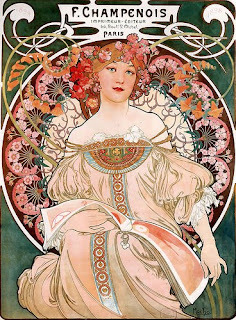 So, I mentioned the other day that I love Art Nouveau. Well, here is more. These two images are from my favorites. 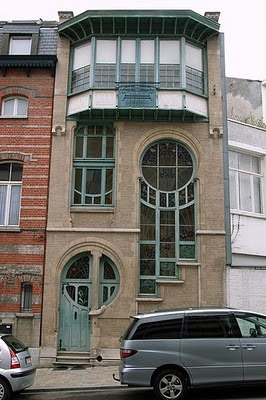 I really like Art Nouveau, so I was looking at a stream on flickr. I just found this, I think I am in love! I also convinced my hubby to build the same for me! I can dream right! I even love the color of the wood. Look close for the stain glass! Check out the stairs coming through! WOW! It was on Stevecadman stream. It had a title of rue 6 in Barcelona. Amazing!!!!!!!!! I made this old Tree skirt about 2 years ago. It was super simple and easy to do. I simply cut six triangle shapes out of cheap batting. Then I stitched the sides together added velcro to the back and sewed on the three coordinating recycled ribbons around the edges. I don't think that it took me too long. I am now wanting to make myself one similar to Mom's see older post. It was a nice first though. I made about 10 sets of these as Christmas gifts this year. I really hope to make a tutorial soon on how to make pot holders. I just looked at some that I had. I made a few prototypes that I kept for us. Wanted to use the Christmas fabric that I got for such a good deal last January. I used old blue jeans for the tough part. I also bought fire resistant batting. I was expensive but worth it. Suprisingly, the metallic thread that was used to make the snowflake was heat resistant. After making a few adjustments to the prototype, I made an assembly line and made all 20 in one day! I like them because they are small and not bulky. I also think they are good for laying out flat on the table under hot dishes. Well, all the family liked them. Would be easy to change up the fabric and make them for all the holidays. I used recycled fabric and it was a great cheap gift to accompany a cookbook for charity. Here is the awesome tree skirt that I made my Mom for Christmas! I cant believe that I am just now getting around to sharing this with everyone. When I first got interested in sewing, my Mom bought me a kit with fabric to make her a tree skirt. She must have given it to me almost 10 years ago. I was still in middle school. It was a giant UFO looming over my head every time Christmas rolled around and she pulled out the same piece of red fabric. I had use some the fabric in prior projects so I pretty much came up with the idea on my own. It is not quilted, I hand tied it with yarn and bells. I really liked the Christmas fabric with the snowmen, but it was very bold and loud. I used Christmas ribbon to just tie up the back. I used some sentimental fabric for parts of the hearts and stars. I enjoyed looking through Christmas theme flickr for inspiration. I really love blogging for fiber arts. I cant imagine what I would do with out this outlet and inspiration. I learned a lot of skills and a tried some new things. I did my first heart and star patches. I appliqued my first complicated design on the snowmen with metallic thread(first usage). So she flipped out and cried when she realized what it was. I like it a lot too and really want one for my self. This is a very memorable project and gift to give. Love you Mama! Here is one proud Dad on Christmas Day with his new handmade quilt. I worked very long and hard a getting this one all together for the unvaling. Dad's shirts made most of the plaid pieces. I used part of my girl scout skirt, dress fabric and a few other sentimental scraps. Unfortunately, I never had the opportunity to machine stitch around the trees.